The Crawford County Board of Elections said no Monday afternoon to a initiative petition request by Citizens for Galion for an audit of the city’s electric rate structure. 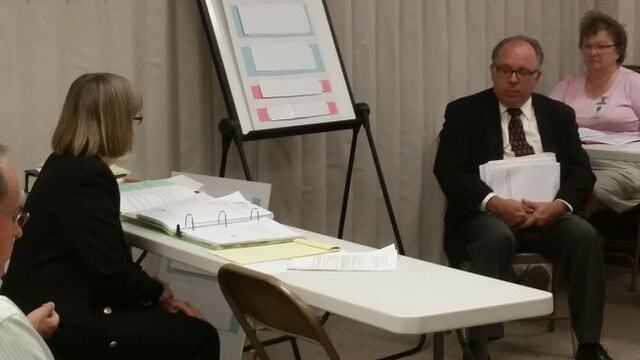 The board ruled 4-0 not to place the issue on the ballot after the group had previously certified the signatures. The city based its case on the following issues. “The board found sufficient grounds on each part to grant the protest and not place the issue on the ballot,” Crawford County Prosecutor Matthew Crall said. The board gave its decision verbally, but will issue a written decision on the matter. Citizens for Galion representative Roberta Wade, who argued in favor of the group, did not immediately return a call seeking comment. As of today, the petition will not be on November’s ballot. We’ll continue to update this breaking story here. Citizens for Galion representative Roberta Wade questions Auditor Brian Treisch during a hearing Monday at the Crawford County Board of Elections. http://aimmedianetwork.com/wp-content/uploads/sites/38/2015/08/web1_wade.jpgCitizens for Galion representative Roberta Wade questions Auditor Brian Treisch during a hearing Monday at the Crawford County Board of Elections.